There were a number of topics discussed around Falkirk's boardroom table when the club was relegated in 2010, but one in particular turned out to be vital. The directors and other key staff talked about the strategy the club would implement given the financial challenges following their drop down a division. After five years in the top flight, a Scottish Cup final appearance and two forays into Europe (the first being their debut in continental competition), Falkirk's average turnover was around £4.5m. In the second tier, it would hover around £2m. In the boardroom, though, the choice was made to continue to invest in the club's academy, maintain their presence in the development league and continue to focus on developing young players, moving them into the first-team as soon as they were ready and trying to captialise on their asset value by selling them at the right time. When Ross Wilson joined the club in 2004, he entered an environment full of energy and looking to build on a successful youth set-up under Ian McIntyre that had produced the likes of Lee Miller and Mark Kerr. Soon, defenders Darren Barr and Tam Scobbie were breaking through and, following relegation, the key asset was Scott Arfield. Others, too, were beginning to emerge, such as Murray Wallace, Conor McGrandles, Jay Fulton and Stephen Kingsley. "I sat round that boardroom table in 2010 when the discussions were being had," Wilson says. "I was emotionally connected to it, but I could still step back and say it wouldn't have made any sense to pull the plug on it. "The evidence was there that the academy system was producing and it was structured in such a way that it wasn't costing the club a king's ransom. "We were confident in the structure and the people working within it, and the calibre of the players at the club. We were also aware that we would structure transfer deals so that the club would benefit at the point of sale but then again in the future depending on the success of that player." Five years on, Falkirk could yet hold off Hibernian to finish runners-up in the Championship and be spared the first round of the promotion play-off matches. While in the second tier, they have reached the Scottish League Cup semi-final, the Scottish Cup semi-final and last season's Scottish Cup final. It has all been built around academy graduates. 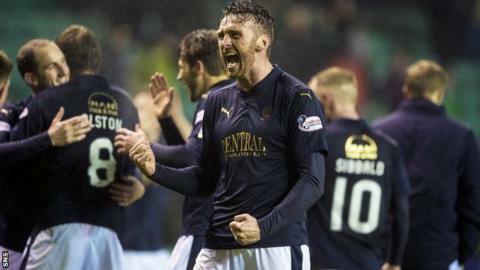 The set-up, and the commitment to it, has been central to Falkirk's ability to stabilise following relegation and build towards promotion and, the club hopes, a sustainable spell back in the top flight. Difficult financial decisions had to be made, because maintaining the development set-up brought necessary expenses, but player trading has become a key foundation of Falkirk's work. The club has become very shrewd in the timing of player sales, with Arfield generating a record fee of £400,000 initially, potentially rising to £600,000, when he joined Huddersfield Town. "It used to be that getting a transfer fee was an exception rather than a rule, but we've got better at it," say the club's former chairman Martin Ritchie. "We work on it and we will look to next season and be thinking about which players have a chance of moving on. Although we can afford not to have anybody going out, we don't want to break that cycle. "We have to look on the players as assets and when does an asset have value. We don't just rely on people phoning us up or on the player's agent. "We realised that we had to do part of the work. It didn't happen by chance, it's because preparation was done, people were involved, contacts were made and it became part of the way that we ran the business." In 2014, Ritchie led the compiling of a report into how other small clubs in England and Scotland, as well as other sporting and non-sporting operations, structured their operations and businesses. The result was the Sustainability Review, which continues to guide Falkirk's work. Dundee, Hearts and Rangers all climbed out of the second tier, following individual insolvency events, on the back of losses generated in their promotion seasons. Falkirk currently make a £250,000 loss on normal trading, but have been profitable in the past two seasons due to cup runs and transfer income - in the past five years, Falkirk have generated £2.5m in transfer income. "Some of the advice we got was that at better-run clubs, the football strategy is owned by the club's board and not by the manager," Ritchie says. "Now, there was still a lot of room for the manager to express himself, but the club owns the strategy, which means we will invest in the academy. "What we have failed to do in these five years is get promoted. Our timing wasn't good. For the first couple of years after we got relegated we were in no position to do anything. The last couple of years we've been in a better position, but we've had Rangers, Hearts and Hibs to contend with." Falkirk are on the right track with their strategy, though, with the team second top and the club sitting with money in the bank.